Get ready for some fireworks! The Fourth of July is right around the corner, meaning you need to hop to it to make your desserts as patriotic as the decorations. 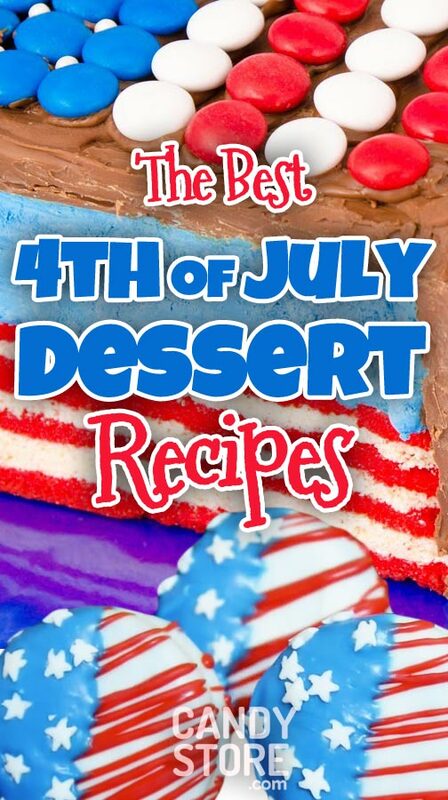 Take a look at the following Independence Day dessert recipes so this year is more delicious and thematic than ever. If you need inspiration for your overall décor, check out some more red, white, and blue 4th of July party ideas. People won’t have a problem saluting this flag—not with all the chocolate candies and icing that’s involved. Set it front and center on the dessert table so guests have time to oogle it before cutting it to pieces. This baker makes a complicated Fourth of July American flag cake look easy! It does take a little more work to layer the red, white, and blue cake, but it’s worth it for the full patriotic effect. Although, no one will know the difference if you skip making the inside pretty and just copy the candy flag garnish! We certainly won’t tell. Candy bark is one of the most customizable, easy, and quick desserts you can make. Plus, it can be done weeks ahead of time and stored in the freezer–perfect for a time-crunched host. If you’re bringing something to a friend or family member’s barbecue, try this patriotic candy bark. It’ll take less than an hour of your time and will make a big statement. Here’s a tip: wrap each candy bark piece up in its own goodie bag so your guests can go home with something yummy. Are you planning on having a bunch of little kids running around on July 4th? Then you probably don’t want to mess with a roaring fire to make s’mores. This is how you can keep that traditional dessert flavor at your Fourth of July Party without anyone getting hurt. You can also have a DIY s’mores station at your July 4th picnic if all guests are old enough to handle molten mallows and flames. Set out Graham Crackers, chocolate, marshmallows, and other decadent ingredients like Reese’s Peanut Butter Cups and caramels. It’ll be sticky, but well worth it. This recipe’s riff on the classic lollipop qualified it for our list. While cake pops themselves are super simple to make, you’ll need to watch the video to learn how to make the American flag candy coating. Cake pops get stale pretty quick, so try to make these no more than one day prior to your Fourth of July celebration. If you’re worried, you can also wrap each in a cellophane baggie to keep them fresh and beautiful. Combine your love of sweet, salty, crunchy, and patriotic with these July 4th potato chips. They’re dunked in white chocolate and dotted with sprinkles and icing to finish off the all-American look. The white chocolate gives these chocolate dipped potato chips the classic American flag feel, but dark chocolate with red, white, and blue candies would also be a delicious variation. Go with your gut on this one; it won’t steer you wrong. Make your own American-made ring pops by following this tasty tutorial! The baker here is zany and creative, so you’ll have fun learning how to make this DIY candy dessert. If you have kids celebrating the Fourth of July with you, then you must make these Ring Pops. The kiddos will love them! Plus, they’re safe for children to eat since they can’t choke on a stick or small candy pieces. The Fourth of July isn’t over until the fireworks sing! The same goes for your party. Before everyone leaves, give all of your guests one of these candy firecracker favors. It’s the perfect sweet treat to remember the party by. You can also check out some other 4th of July firework recipes if you love a celebration that snap, crackles, and pops. We hope you all have a wonderful, safe, and delicious Fourth of July! Let us know how you make out with these recipes by posting pictures and stories in the comments section below.